The parking lot below Trader Joe's and the Seaholm Redevelopment Project is a 3 storied underground structure. Like many parking structures it is functional and structural with gray exposed concrete as the main visible finish. 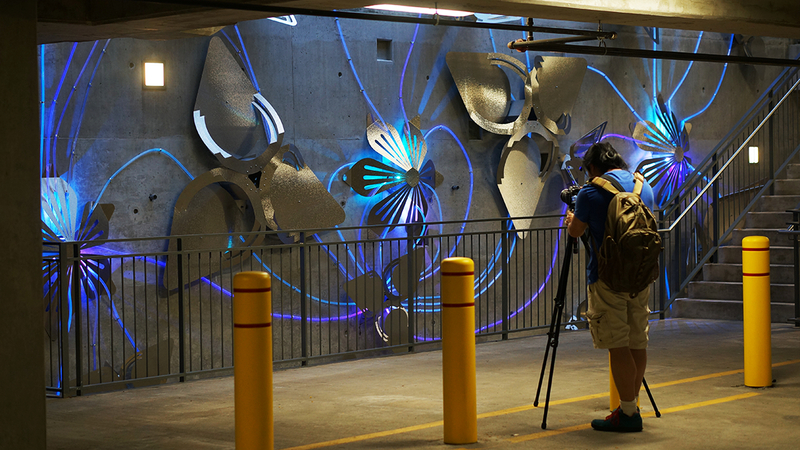 A 40’ x 40’ concrete wall adjacent to the staircase that facilitates the passage of people from the underbelly of the parking lot to the Seaholm Plaza. This empty canvas was made available to us by the City create a project that could transform this place from purely functional to a joyful and delightful experience. Since the redevelopment plans called for environmentally sustainable features and the parking lot is under a green roof, we felt this was a stellar opportunity to create a living sculpture that complemented the sustainable roof and extended the foliage into the stairwell. To that end, we created Golden Afternoon. The installation mimics a hanging garden that has overgrown from the flower beds on the ground level, down the open stairwell, and is making its way into the parking lot. 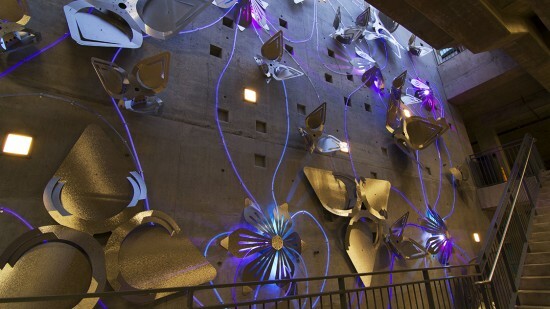 This hanging garden evokes a sense of fantasy because of its gigantic reflective flowers and illuminated fields. 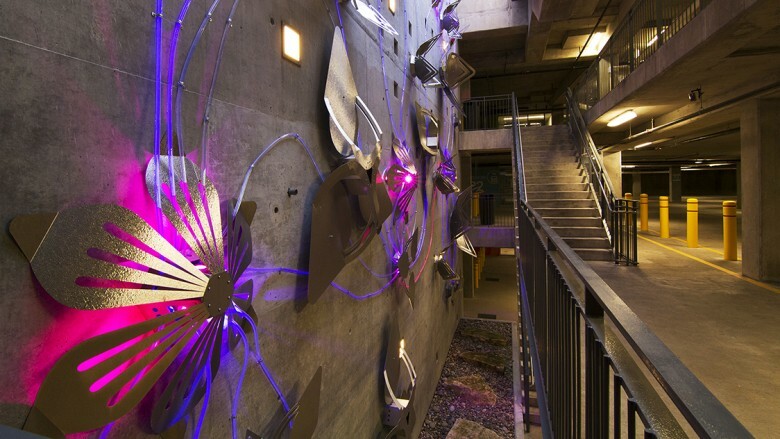 It responds to people walking up and down the stairs by sending light through this natural surreal ecosystem. 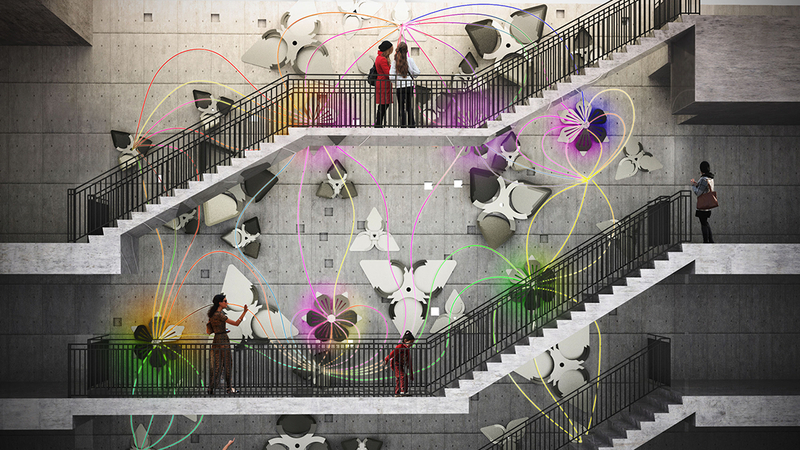 The stairs mimic the rabbit hole of the fantasy novel Alice in Wonderland, and the piece aspires to create a sense of wonder and delight akin to being in fantasy or wonderland. 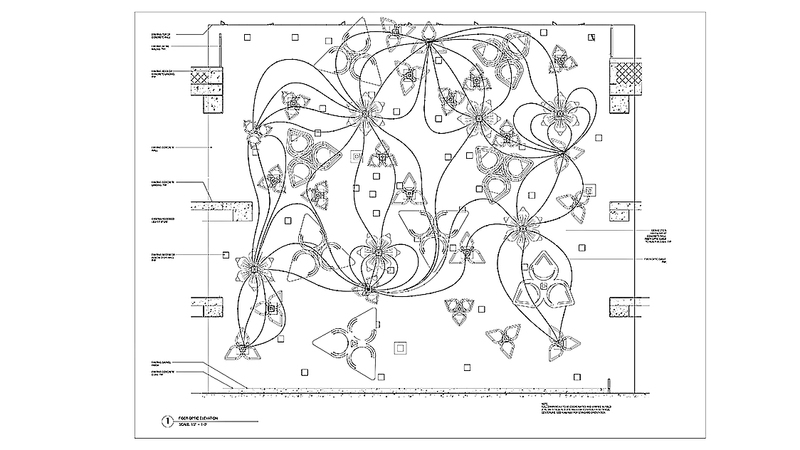 The forms used in the artwork are primarily based on the floral geometries of the Prairie Nymph and the Indian Blanket, which are wildflowers popular in Texas. 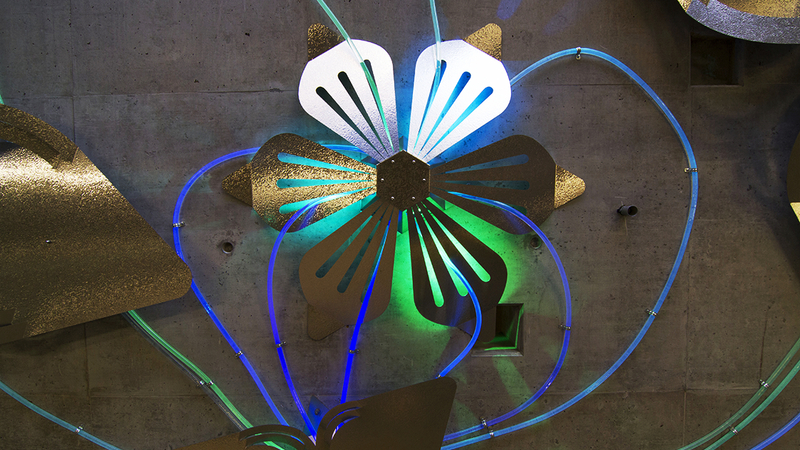 The flower geometries are created out of sheet metal with a reflective or iridescent finish, and the light fields are made from fiber optic cable. Through various times of the day, the floral sculptures cast a variety of shadows on the wall thereby creating interesting patterns through the day. 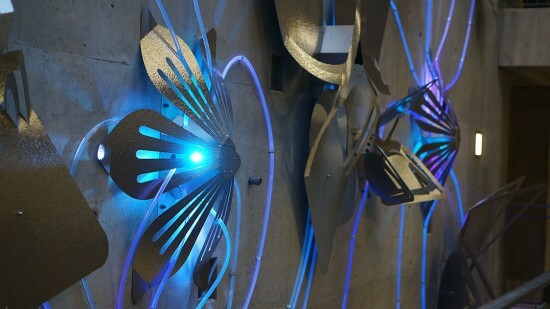 During evening hours, the light field turns on and creates another dramatic experience for the passers by to enjoy. The piece is made of textured stainless steel which is laser cut, bent, and welded into discrete floral components inspired by Texas wildflowers. LED illuminators and 18mm solid side glow fiber optic cables are used to create the illuminated fields. 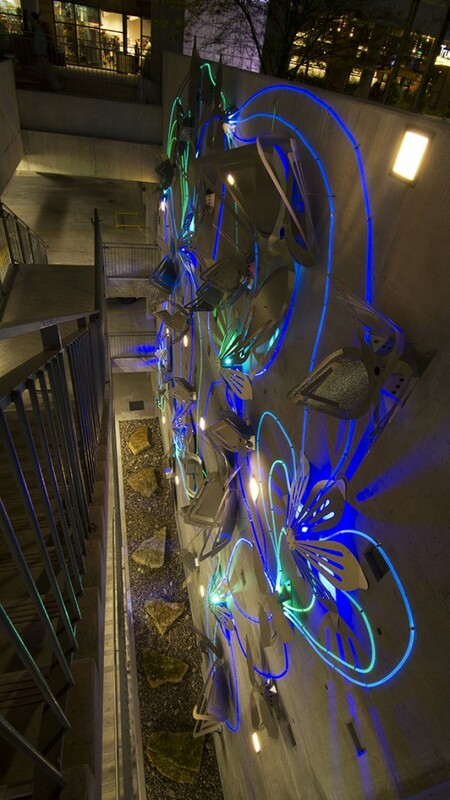 These strands are routed from rear of wall and illuminated using proprietary RGB LED illuminators mounted in fan cooled NEMA enclosures. 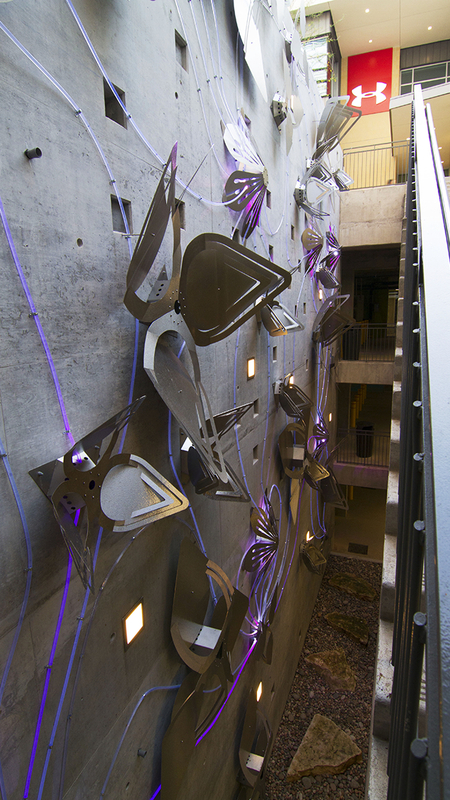 Five high performance ultrasonic rangefinders are mounted at different levels of the wall to sense human presence in order to trigger the six custom animations that ripple through the piece. 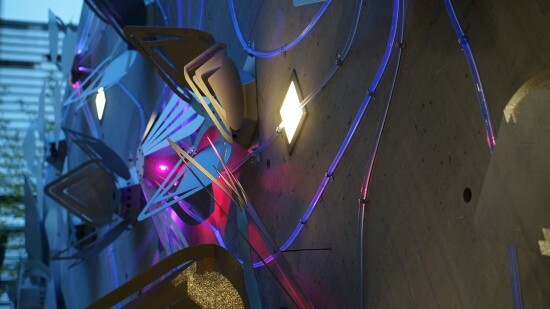 These animations are programmed and controlled using TouchDesigner and DMX. Golden Afternoon could not have been possible without the contribution of a wide varieties of partners with varied expertise. The project was created in partnership with Rigidized Metal, Lightfaktor, Shur-Rig LLC, John Rosato from Southwest Strategies Group, Bill McCain, Global Electric and commissioned by the Arts in Public Places, City of Austin. 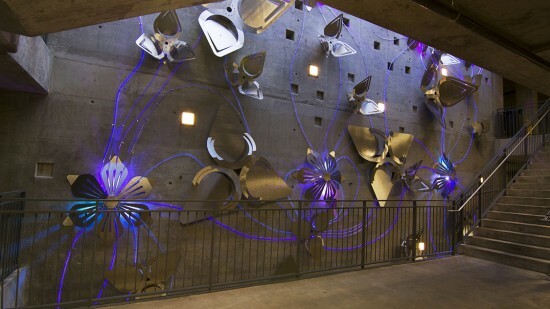 The project was managed by Jean Graham and Susan Lambe of Austin Arts in Public Places.